Decrease Employee Turnover. Increase Productivity, Sales, & Profits. With the Most Accurate Hiring Test. Over 99% accurate. In use for 40 years. Do applicants interview well, get the job, and then perform poorly or quit? Many applicants interview better than they perform, and it is hard to get the information that you need from references. Do you have high employee turnover? According to the US Dept. of Labor: 1) Hiring is successful about 50% of the time. 2) 50% of hires stay 6 months or less in their job. Would you like an easy, dependable way to hire top employees? Our company, Simmons Management Systems, proudly offers you the Simmons Personal Survey! With over 99% accuracy, The Simmons Personal Survey is the most powerful job-related assessment tool available on the market. The Simmons Personal Survey, with its 57 performance indicators, accurately and objectively measures the most important job-related emotional and behavioral tendencies, such as: Energy; Stress; Optimism; Self-Esteem: Commitment to Work; Attention to Detail; Routine vs Change; Courage; Decisiveness; Assertion; Anger vs Tolerance; Consideration; Sociability etc. Every one of these Key Success Traits has been proven in hundreds of research studies (both medical & psychological) to correlate with personal health, job performance, and job enjoyment. The person's characteristics are then compared to one of our 28 validated job norms or to a customized norm. This allows you to accurately predict job performance in any job, making the Survey an excellent tool for hiring, placement, management, personal development, training needs assessment, and outplacement. * Note: "Poor Employee" and "Ideal Employee" are on the sample for instructional purposes. Those words are not printed at the bottom of each page. Taking the Test: The test is given on our web page and is very easy to complete. It can be used by anyone with a 6th grade level in English. A Spanish version is also available. We ask 720 very short questions, giving us a huge amount of data to insure validity and to support our multiple scales. Yet, the test only takes approximately 30 minutes to complete. That is a wonder in itself. It can be taken on any type of computer (both PC and Apple), touchpad, or smartphone, using any internet browser, 24 hours a day, 365 days per year. Our 2 duplicate test websites have 100% up-time. Validity Checking: First, we check each person's answers and scores for 10 different patterns to determine if they took the test in a way that would produce valid results. Normally, there is a green message stating that the results are valid. If the person attempted to fake the test or did not know themselves well enough to be realistic, we give a warning in red. The Report: The far left column of the report shows the 13 Key Career Traits. For each scale, we provide an in-depth description of the person�s feelings and likely behavior. We also detail what the person wants or needs to be comfortable. Job Norms: The Survey compares an individual to a single job norm (one of our 28 validated norms or a custom norm that is created). These norms represent the characteristics necessary for success in each type of job. How well a character tendency fits the norm is revealed by the relation of the colored bar to the line beneath each bar. This "norm line" shows the positions considered to be Ideal ("I"), Good ("G"), and Fair ("F"). For emphasis, the bar is green if the scores are good or ideal. The bar is light red if the score is fair, and solid red if the scores are too low or too high for the norm. This makes it easy to instantly spot strengths, and areas requiring attention. You can easily see a person's good and poor qualities just by looking at the color of the bars. What a Top Applicant Looks Like: Look at the sample below. Note the green bars easily showing you that this person has the characteristics for success in their job. This man was a star Executive in his company. As you read this report, you can easily see what made him outstanding. What is amazing is that we gathered this information in just 30 minutes! What a Poor Hire Looks Like: Below we show a report of someone who did very poorly at their job. This is easily shown by the red bars. We Surveyed this person after they had been hired, before the company used the Survey. 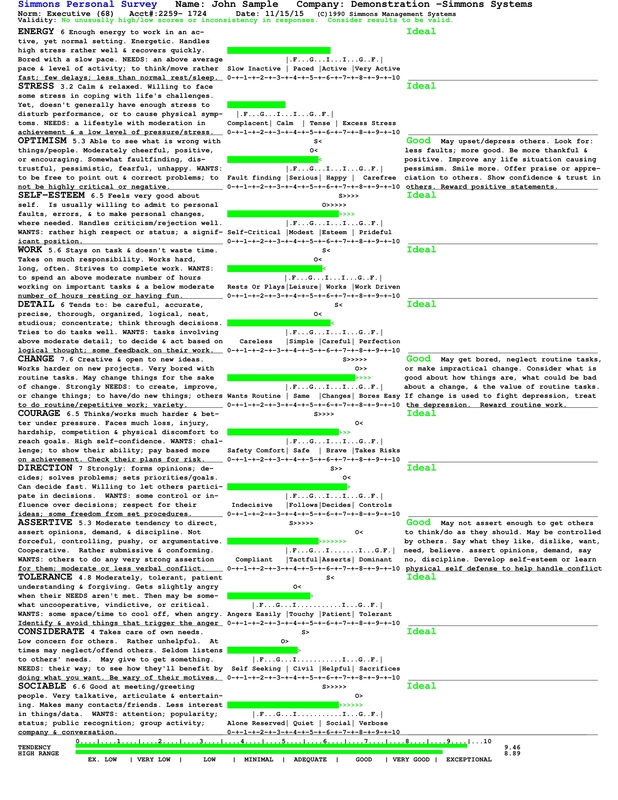 As you read this report, you can see the exact reasons why this person was failing: Excessive Stress; A Negative Critical Attitude; Low Self-Esteem; Low Attention to Detail (error prone); Excessive (impractical) Change - inability to follow routine methods; Dominating Decisions; Bossing and Forcing People; Extreme Anger and Vindictiveness; No Empathy or Concern for Others. And yes, this person was exhibiting all of this. Employee Problems and Turnover can be Avoided: Many people can be helped, but this person was not cooperative and had to be terminated. He was not terminated because of the test, but due to what they had already done. Had this person been Surveyed previous to hiring, these problems would not have entered the work place, harmed customers, etc. And they would have known in 30 minutes. The "Self" and "Others" Scores: In the middle column, we graph in the Self scores as "S". This is how the person sees themselves and how they are most comfortable. We show the variance in how they see themselves with ">", We graph in the Others score as "O". This is how others see them behaving. We show the variance in how others see them with ">". Recommendations for Success: To the right of each scale is a norm comparison and goal. First is a one-word color highlighted rating (e.g. Good) which corresponds to the information found on the norm line. Usually, the sentence directly following this rating gives an idea of what problems would be caused when the character tendency doesn't ideally fit the norm. Following this comparison are goals. The goals show what the person needs to do to fit the norm better. Total Job Fitness Rating: At the bottom of the report, we calculate how well the person's tendencies fit the entire job norm. This score ranges from zero to 100, and is accompanied by a descriptor such as Low, Minimal, Very Good, or Exceptional. These bars are also color highlighted. Adequate and lower are printed in red. Good through Exceptional are printed in green. Variability of Job Fitness: Also at the bottom of the report, we take the highest score from each scale (self or others) and compare those scores to the job norm. An overall score is computed and displayed for this. As you know people have tendencies, what they usually do, but some people are quite variable in their feelings and behavior. We take these variations and project how well the person fits the job if and when they fluctuate. Ready to be Used by Anyone in Management: This report is extremely accurate and easy to understand. Once a person has read one report, using our included instructions, they would be capable of continuing to use the reports with no need for someone to guide them. Copyright 2003, Simmons Management Systems. All rights reserved.